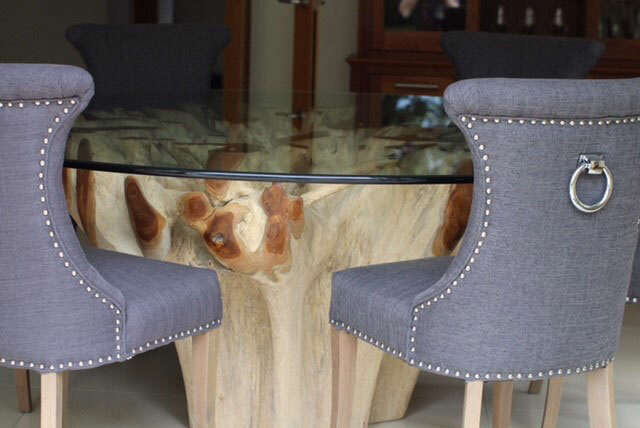 Our teak root tables are made using entire root systems from trees that have been excavated from sustainable forests. Each root base is unique in shape, size, texture, and colour – this means that every root table is a one-off. We spend a long time sourcing teak roots that have a structure suitable to be used as a complete system, without legs or extra features added. Our ethical policy is very important to us; each root is reclaimed from a sustainable forest and we know where every piece has come from. Our tables are not mass produced – every single one is a piece of art in its own right. The sustainable root table base is topped with a thick piece of toughened glass (19mm or 15mm). 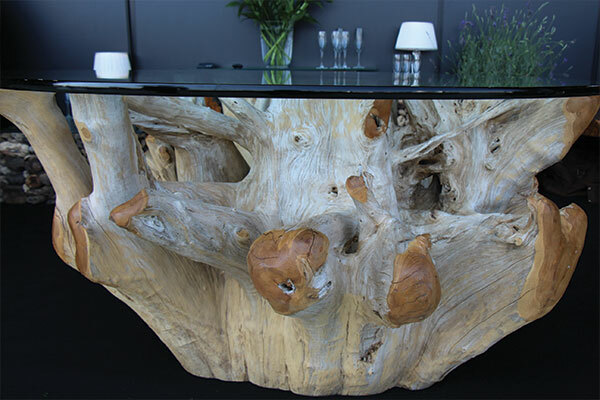 The glass top makes the table practical for everyday use whilst ensuring that the eye catching structure of the root system is visible all times. 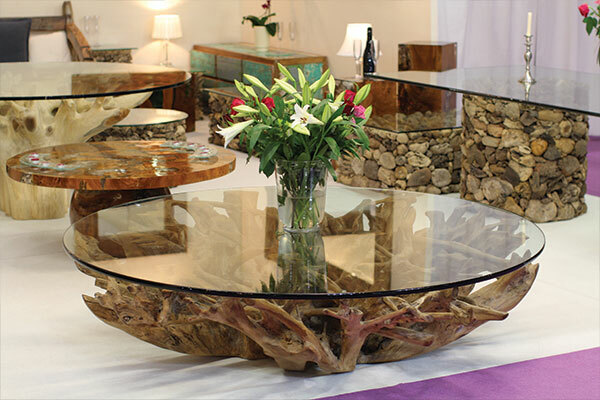 A variety of coffee table and dining table designs are available. Our teak root tables are very similar to the table that is featured on BBC One’s ‘Saturday Kitchen’, hosted by celebrity chef James Martin. If you’re looking to get the ‘Saturday Kitchen’ look in your home, please get in touch – we will design a table based on this model that fits perfectly in your kitchen or dining room. Standard sizes are listed below, however, we also provide a commission service for the design of bespoke pieces. Whether you choose a standard size or a bespoke design, the root base will be totally unique. The reclaimed teak root is hand turned into a perfectly round shape before being polished and oiled. 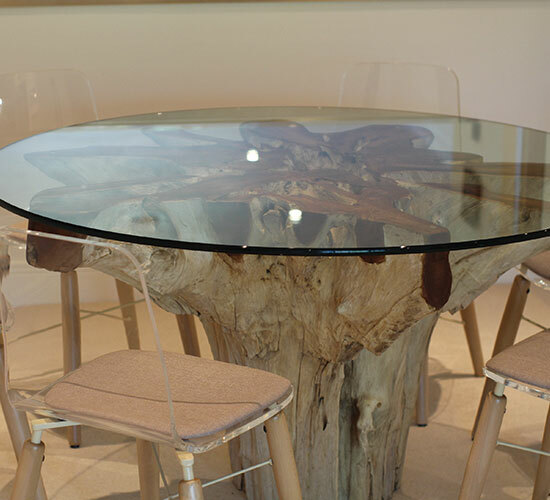 The wooden root base is then topped with a round toughened glass top. •	Glass size: The glass top can be purchased in 80cm or 65cm diameter. 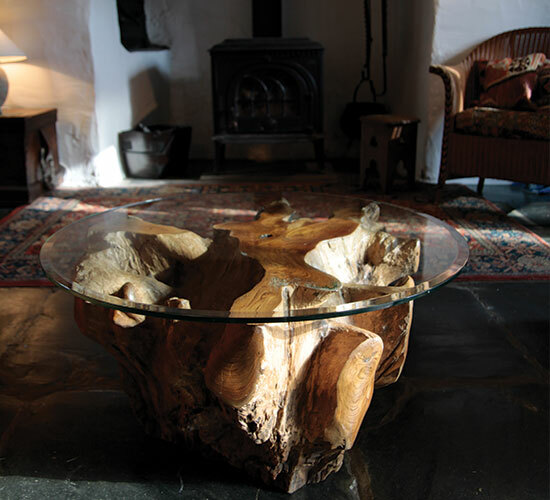 This stunning root table has a toughened glass safety top and will act as a striking centre piece in your home. The base of a tree produces a complex root ball that has been formed by years of growth under the soil. Our teak sculptures have been created by recycling and reshaping root systems – each ball is perfectly round and has its own unique internal structure. Once shaped, they are finished with a polish to enhance the texture of the grain and give the sculptures a deeper colour. A sculpture from The Apple Collection will complement a root table and complete your range of sustainable teak root furniture.